The Guadalupe Mountains span the Texas/New Mexico border and rise to heights of 8,749 feet, in great contrast to the flat Chihuahuan Desert land all around. Two national parks are found within their range; Guadalupe Mountains (in Texas), which features rocky peaks and scenic valleys with varied wildlife, and Carlsbad Caverns, one of the oldest and most famous cave systems in the world. The caverns are a full day's drive from any of the other major attractions in the Southwest, but are well worth the long journey - they include several vast underground chambers, up to 250 feet high, filled with amazing formations of many colors and shapes. A long straight road is a common feature of the Southwest, and the caverns are reached by one such route; US 62/180 that links Carlsbad with El Paso. The western stretches in Texas pass 100 miles of salt flats, sandy wasteland and grassy prairie before the forested Guadalupe Mountains come slowly into view, then, after a steeper and more winding section, the highway straightens out again, crossing more desert flats towards Carlsbad. The turn-off to the national park is marked by a collection of Western-style souvenir shops, restaurants and lodgings, known as White's City, including the last gas station for 130 miles westwards. From here a rather narrow and winding side road climbs for 7 miles through a shallow limestone gorge (Walnut Canyon) that has attractive rocky scenery with particularly abundant Chihuahuan Desert plants such as agaves and opuntia cacti. There is no campground in the park, and the only official site nearby is the rather pricy establishment at White's City, though free primitive camping is possible along several dirt tracks heading east from US 62/180, a few miles south of the park junction. 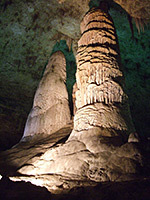 Apart from White's City which has a motel, the nearest place with hotels close to Carlsbad Caverns National Park is Carlsbad, 27 miles northeast of the cave entrance. The entrance to Carlsbad Cavern is on the plateau at the south side of Walnut Canyon, where a huge visitor complex has been constructed, with acres of parking and a network of service roads. Inside the main building are a museum, book store, auditorium, cafe, cinema-style counter for purchase of tour tickets, and elevators that provide a short cut into the caverns below. The fee to enter the caves is $6 per person (unchanged for many years), although entrance to the park is free. Other attractions in this section of the national park include the 9.5 mile, one-way Desert Loop Drive (no vehicles over 20 feet allowed) that continues westwards along the plateau top then returns via upper Walnut Canyon, and the one mile Chihuahuan Desert Nature Trail through similar scenery close to the cave entrance, while elsewhere in the park are several longer hiking trails and many secret backcountry caves, a few of which are open to the public, but of course almost all visitors come only for the trips underground in the main cavern. 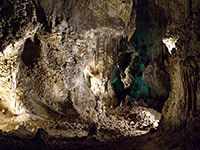 The usual way to see the formations of Carlsbad Cavern is by one or both of two self-guiding walking tours - Big Room or Natural Entrance - which visit different parts of the chambers. 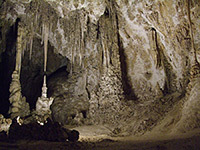 Four other branches of the cave may be explored by ranger-led hikes, for an extra fee (Kings Palace, Left Hand Tunnel, Lower Cave and Hall of the White Giant). - for this, the less strenuous option, visitors descend 754 feet over one minute in an elevator that starts from inside the visitor center to be greeted, rather incongruously, by a rest-area and lunch room, but a short walk along a wide passage leads to the main cave area - the Big Room, 3,800 feet long and 600 feet wide, where most of the largest formations are found. The 1.25 mile path follows a roughly circular (anti-clockwise) route down one side of the chambers and back along the other, and the cave is so large that the two parts of the trail are generally out of sight of each other. 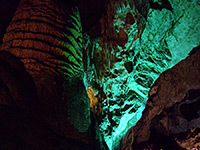 Around 20 of the most spectacular speleotherms have an official name - grandiose appellations such as Hall of the Giants, Temple of the Sun and Rock of Ages, and are subtly lit with electric lights to create a most enchanting spectacle; the lights are white, so all colors in the caves are natural. Some areas have shallow underground pools, also illuminated, whose reflections add another dimension to the delicate formations above. Rangers are stationed at frequent intervals to answer questions, and the tours are usually very busy, so this is hardly a wilderness experience, but still one of the highlights of the Southwest. Along the main trail are many closed gates guarding small paths leading to unseen passages, and there are frequent glimpses downwards to deeper levels, some not easily explorable including the Bottomless Pit, 370 feet deep. Most parts of the Big Room route are wheelchair-accessible, and all have a special non-slip surface. - a gentle walk across the cactus desert leads to a huge opening in the plateau, where the path zig-zags down into the darkness below. This chasm is the place of egress for a colony of up to 300,000 Mexican free-tail bats that live in one of the branches of the cave below from April to September, and it is a memorable event at sunset to watch the colony emerge, which takes up to half an hour. The bats spend winter in the warmer lands of Mexico. An amphitheater has been constructed at the entrance, and organised evening sittings are provided in season (no photography permitted). Underground, the path is quite steep at first as it drops 750 feet, into a large, dimly-lit chamber that is initially devoid of formations. This passageway continues eastwards into the bat residence, but the path turns back west, descending again, gently at first then more steeply, into narrower tunnels where the first extensive collections of stalagmites and stalactites are found, including such named features as Devils Spring, Queen's Chamber, Kings Palace and the Boneyard. The surroundings become steadily more scenic, with small side-caves filled with intricate rock forms, before the path arrives at the elevator to the surface visitor center, and links with the Big Room route as above. - four separate chambers accessed from a cave near the elevator. This is the deepest part of Carlsbad Cavern currently open to the public, 830 feet in one section, and may be visited as part of a ranger-led tour that lasts 90 minutes and is provided five times each day, between Memorial Day and Labor Day. 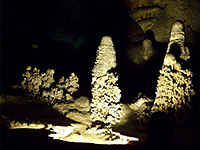 Highlights include the Queens Draperies, a particularly large series of rippled sheet formations. - lantern-lit passageways featuring fossils, cave pools and delicate speleotherms. The tour is held once each day and lasts about 2 hours. - a vast lower level, branching off the Big Room about half way along the loop, filled with equally spectacular features as the main chamber. Accessed by metal ladders, and visited on a 3 hour tour starting 1 pm, Monday through Friday. 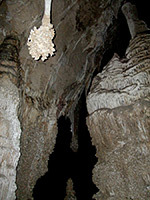 - a more remote section of the cavern, containing a huge white stalagmite. The tour requires crawling through narrow passages and climbing metal ladders, costs $20 per person, lasts 4 hours, and is scheduled only once a week (on Saturdays). Details of other areas of the park, including hiking trails and backcountry caves.